Saute the onion in butter. Add flour and mix well. Add milk and keep stirring... until well combine. The mixture will thickens and add peas and potatoes. Keep stirring for few minutes. Once the mixture bubbles, add the smoke fish and chopped fish fillets. Season with pepper. 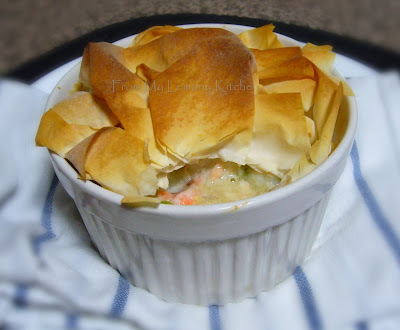 Tip: the recipe stated to use puff pastry, then cut the puff pastry to fit the top of the ramekins. Brush with egg and bake for 20 minutes at 200C.